Take I-95 North. You will then need to take an exit just south of Portland onto I-295 North at Exit 44, or north of Portland at Exit 52 onto the Falmouth Spur over to I-295 North. Continue taking I-295 North which reconnects with I-95 North just south of Augusta, and continue on I-95 North. Take Exit 109, the first Augusta Exit, off I-95 North. Stay in the left lane on the exit ramp for Route 202 West (toward Winthrop), then as soon as you get onto Route 202 West, scoot over into the left turn lane and take a left turn onto Whitten Road (at the first traffic light only a few hundred feet from the end of the exit ramp). From Downtown (west side) Augusta rotary, take Route 201 South about 1 1/2 miles, then turn right (away from the river) onto Central Street in Downtown Hallowell at the Clock and proceed about 3 miles, following the blue and white signs to Maple Hill Farm Bed and Breakfast on the Inn Road (our driveway) off the Outlet Road in Hallowell. 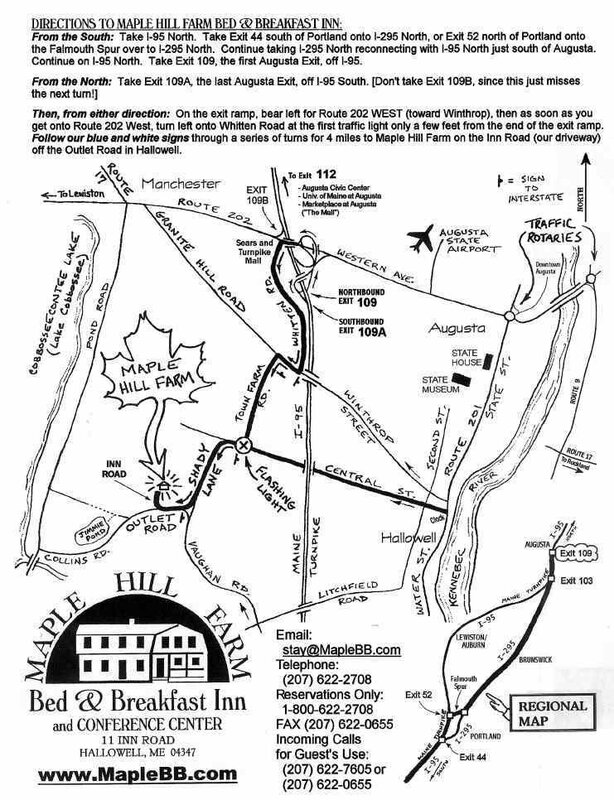 From Downtown Gardiner -- NOT the Gardiner Interstate Exit -- take Route 201 North about 4 miles, then turn left (away from the river) onto Central Street in Downtown Hallowell at the Clock and proceed about 3 miles, following the blue and white signs to Maple Hill Farm Bed and Breakfast on the Inn Road (our driveway) off the Outlet Road in Hallowell. Call us at 207-622-2708 if you would like assistance.